Light Fixture Carts (LFC) carry bulk electrical materials through job sites for quicker, safer installation. Each unit carries full-sized commercial light fixtures with a total load limit of 1,000 pounds. Save time on any commercial construction project by easily transporting all light fixtures directly to the point of installation. This ergonomic material handling cart is designed specifically for light fixtures, so it keeps these valuable materials more secure than stacking them onto a non-specialized cart. It is also safer for electricians, as it removes the common manual material handling task of carrying light fixtures to the installation site. The LFC is easy to transport and reposition. Two heavy-duty casters swivel while the others remain fixed, improving maneuverability for narrow aisles. Locks on all swivel casters keep the unit securely in place for loading and unloading tasks. These units are also ideal for electrical supply houses, where they provide dependable organization and storage for fixture stock. Removable locking bars on both sides protect contents during travel or storage. 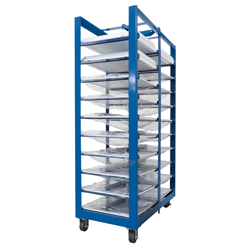 In addition to standard models of Light Fixture Carts, custom sizes and configurations are available. Contact BHS today to learn more about customized electrical material handling equipment to meet any challenge. Call 1.800.BHS.9500 to find a dealer for BHS Light Fixture Carts and other electrical material solutions.